When you offer top tier services to a discerning audience of high net worth VIPs, it’s important to cut through the clutter and get your message across quickly. That was the idea behind the newest print media ad we’ve designed for leading aircraft charter provider Avjet. 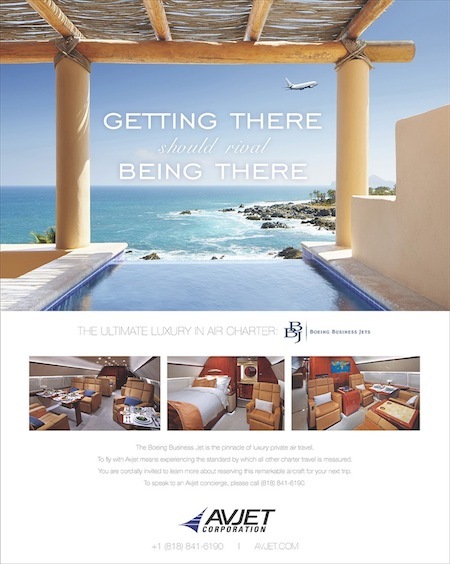 Avjet offers its elite clientele an exquisite fleet of large cabin, long range executive jets, including the BBJ featured in this ad, as well as the new Gulfstream 650. Because they offer superlative service that sets the industry standard, we needed to create an ad that immediately conveyed the idea that getting to one’s destination should rival the destination itself.